The site of the former Millard Fillmore Gates Circle Hospital will be redeveloped into Lancaster Square; a vibrant, mixed-use, urban place featuring street-level retail, modern apartment living, commercial office space, food service, and an existing 750-space parking garage. At the heart of this development will be a central square that will function as a gathering place for pedestrians and a hub of activities of all types. A key feature of the project will be the extension of Lancaster Avenue through the site from Delaware Avenue to Linwood Avenue. 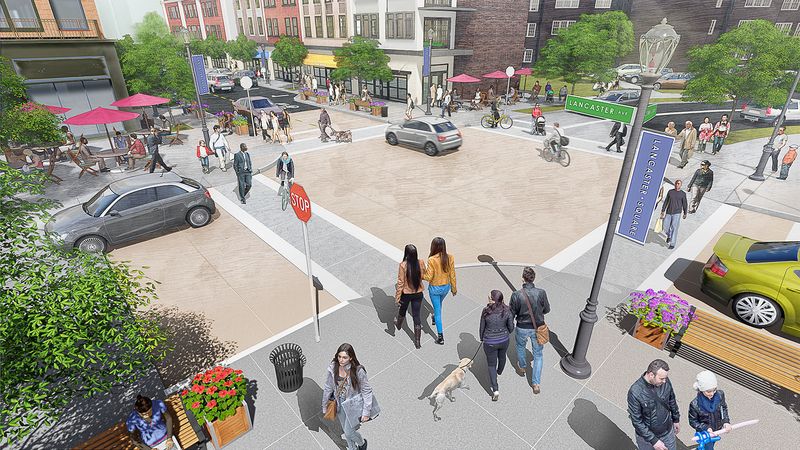 This will open up the site, creating a tree-lined boulevard flanked by ground floor retail and commercial uses, which in turn will connect neighborhoods to the east and west with a walkable, attractive urban streetscape. We welcome community input throughout the redevelopment process and invite you to provide us with your comments using the contact form below. • Installed roads to open the site and connect neighborhoods. As part of the site preparation phase, the 11-story hospital tower was imploded – an exiting milestone in the site’s physical transformation. Click here to watch a video of the implosion. Having set the table for new building construction, TM Montante Development has partnered with Morgan Communities and is now moving forward with mixed-use buildings that will include retail storefronts on the ground floor and residential units above. The development team is working toward construction in 2018. What is the project timeline and when will the project be completed? ANSWER: The project will be completed in stages over 5-7 years. Site prep work began in 2015 and continued throughout 2016. Residential, office and commercial space will be developed in 2017 and beyond. Is the development going to be open to the public? ANSWER: Yes! Morgan Communities and TM Montante Development's plan is to develop a vibrant, mixed-use urban area with walkable streets and lots of public space. Will you organize opportunities for community involvement in the development of the project? ANSWER: TM Montante Development and Morgan Communties are committed to involving the surrounding community in the development process. We welcome community input and we invite you to provide us with your comments using the contact form below. Will Lancaster Avenue extend all the way to Linwood? ANSWER: Yes, Lancaster Avenue will be extended from Delaware to Linwood. The road has been designed with traffic calming measures in place in order to slow down vehicular traffic and improve safety for pedestrians and cyclists. TM Montante Development and Morgan Communities are hoping to get started within the year on a proposal to build a six-story apartment building at Gates Circle, now that the city Planning Board has renewed its approval of the $15 million project. The developers intend to erect a six-story building at 1299 Delaware Ave., on part of the former Millard Fillmore Gates Circle Hospital property. Located at the northeast corner of Lancaster Avenue, the 60,000-square-foot building would include 59 apartments and 6,000 square feet of commercial space, divided into three storefronts. The 1299 Delaware building was originally approved by the city last May. But the developers say they can’t finalize the financing on it until they nail down some other details, including their $1.7 million purchase of the existing city-owned parking ramp, as well as a possible affordable housing component of the new building. With its city approval renewed for another year, though, “we’re planning to certainly start within that timeframe,” said Montante President Christian Campos. The new building would be part of the much larger Lancaster Square at Gates Circle redevelopment, which Montante and Morgan are undertaking to transform the 6.7-acre vacant former hospital site into a new mixed-use neighborhood. Plans for the $150 million multiyear redevelopment call for more than 500 condominiums, townhouses and apartments, plus an urban grocery, a fitness center, additional ground-floor retail space and potential office space. Already, Canterbury Woods at Gates Circle has opened, with 53 independent-living and five assisted-living apartments, while People Inc. has started work on a three-story senior-housing facility with 37 units at 637 Linwood Ave.
Those are separate from the Montante and Morgan initiative, although Campos cited both as evidence of success in the past year, along with the acquisition of another property at 1275 Delaware Ave. and the signing of a contract for the parking ramp. “We’ve made a lot of progress in that time, and we look forward to moving it forward this year,” he added. Campos said a team from Rochester-based Morgan Communities – led by vice president Kevin Morgan, the nephew of founder and CEO Robert C. Morgan – continues to actively work with Montante officials on the Gates Circle project. “We’ve always been excited to work with the Morgans, because they brought a lot of experience working on urban development projects,” Campos said. TM Montante Development has acquired a Delaware Avenue office building near Gates Circle in a $1.95 million deal that would expand the geographic reach of its already-mammoth project to reuse the former Millard Fillmore hospital site nearby. TM Montante spokesman Byron DeLuke said Friday that the firm’s “initial concept” for its new purchase involves an adaptive reuse of the mostly vacant office building, with residential apartments on the upper floors and commercial or retail space on the ground floor. The development firm owned by Thomas Montante — brother of Uniland Development Co.’s Carl Montante — paid $1.95 million this week to buy the medical and professional office building at 1275 Delaware. The seller was E.C. Mortgage Co. of West Seneca, registered to accounting firm Travers & Co. Built in 1957, the 47,712-square-foot, five-story structure with a penthouse includes a 66-space parking lot, and is valued by the city at $1.176 million. It’s located adjacent to the 10-acre former hospital site, on which Montante and partner Robert Morgan of Rochester are planning a multi-year, $110 million redevelopment of a new residential community. The mixed-use concept fits into the developers’ plans for the larger Gates Circle project, known as Lancaster Square, which calls for up to 500 condominiums, market-rate apartments and townhomes, spread over the site in multiple buildings to be constructed over several years. There would also be retail space for a grocery store, fitness club and ground-floor retail storefronts, and possibly some office space. Montante officials have already had discussions with potential tenants like Tops Markets, Dash’s and the YMCA, but no commitments yet. Montante announced earlier this year that he was teaming up with Morgan, whose fast-growing Morgan Communities owns 36,000 apartments in 14 states, as well as mobile-home parks, self-storage facilities and commercial buildings. Morgan, who initially began his real estate empire by acquiring and upgrading existing properties, has become much more active in new construction and development in cities like Rochester, Pittsburgh, and now Buffalo. The Buffalo News reported in September that the FBI and U.S. Attorney’s Office in Buffalo are investigating how Morgan’s companies finance their acquisitions and developments, focusing particularly on the rent rolls and other financial information they provide to lenders to justify loans. The probe extends beyond his properties in Buffalo, including those in other cities as well. There is no indication that the investigation is affecting the Gates Circle project, where Morgan’s experience and financial connections will come into play, and Montante officials did not respond to inquiries on the subject. In the meantime, the hospital buildings have already been taken down and cleared, and the site cleaned in preparation for reuse. And the partners received city approval for the first phase, a six-story, 60,000-square foot mixed-use building at 1299 Delaware – right next to the office building Montante just acquired. This new facility would include three first-floor retail spaces and 60 market-rate apartments on the upper floors. The developers have also started preliminary discussions with neighbors about a second major building on the site that could host the proposed grocery store and up to 150 more apartments. And Montante has agreed to buy the city-owned parking ramp at 1277 Delaware for $1.7 million, pending approval by the Common Council. In other parts of the former hospital site, Episcopal Church Home & Affiliates opened its new $41 million, six-story urban Canterbury Woods facility with 53 independent-living and five assisted-living units at 3 Gates Circle, while People Inc. is working to erect a three-story senior housing building at 637 Linwood, with 37 units and parking. Separately, the Montante family sold another Delaware Avenue building — housing a compounding pharmacy in Kenmore — to the owner and operator of four other such facilities in the region. DeLuke said the family had initially acquired the building at 2814-2818 Delaware in 1975, with the intention of operating an auto service center under the Broad Elm Tire brand, which the family owned. It was later converted into a fine-dining restaurant 14 years ago, and became a pharmacy. A state agency has approved funding for a 37-unit senior housing apartment project planned by People Inc. at Gates Circle. Amherst-based People Inc.’s Community Housing Development Organization said New York State Homes and Community Renewal approved about $3 million in funds and credits to support the project at 637 Linwood Ave. The project will consist of mixed-income apartments for people 55 and older, and will include seven units for individuals with developmental disabilities age 55 and older who live independently. Construction is set to start this fall. People Inc.’s partners on the project are TM Montante Development and Long Associates Architects. People Inc. has received funding approvals that will allow it to move forward with its $11 million housing project at Gates Circle. The agency’s community housing development division will build the 37-unit senior apartment complex on a long-vacant parking lot on Linwood Avenue just behind the former Millard Fillmore Gates Circle Hospital site in the City of Buffalo. Plans for the project were contingent on state funding and tax credits from the state. Notification was received this week by the State Homes and Community Renewal program on a competitive award of up to $2.2 million in Housing Trust Fund dollars; $616,000 in low-income housing credits and $200,805 in funds through the State Low-Income Housing Tax Credit program. Additional funding has been committed by the State Office for People with Developmental Disabilities. Frederick said the project meets a huge need for housing in the city for individuals age 55 and older. People Inc. signed a purchase agreement on the property from TM Montante Development, which is developing a senior living complex at Gates Circle. Also underway are plans by Canterbury Woods for a site in the city to complement its Amherst-based campus. The development team includes TM Montante and Long Associates Architects. Construction is scheduled to start this fall and continue into 2018. When even a group that generally opposes projects in the Delaware District and Elmwood Village support a development, chances of it becoming a reality grow exponentially. That’s exactly what happened Monday when plans by TM Montante Development and Rochester’s Morgan Development formally presented the Buffalo Planning Board with its proposed six-story, mixed-use building that will help anchor the former Millard Fillmore Gates Circle property. A series of meetings between the development team and neighboring block club groups and other interests played a significant role in the $13.5 million project clearing the planning board. A companion approval from the Buffalo Common Council, which is expected to come on May 16, will clear the way for construction to start — likely this this summer. Designed by Philadelphia-based BLTa, the building has drawn praise from many of the block clubs and residents. It is the firm’s first Buffalo project. The building is Montante’s first on the former hospital property and because of its location at the northeast corner of Delaware Avenue and soon-to-be-christened Lancaster Avenue extension, it will serve as a development gateway into the 6.7-acre parcel. Canterbury Woods 58-unit senior housing project, being developed separately from Montante’s buildings, is already under construction and expected to open this fall. Nate Sunderhaus, a BLTa principal, said the curved brick building was designed to fit in with the Delaware District architecture. Approximately 70 percent of the units will be one-bedroom apartments and the remaining 30 percent will be two-bedroom units. TM Montante Development has dubbed the building Lancaster Square at Gates Circle, partially because the building will overlook the Lancaster Square, a public gathering location within the former hospital property. Lancaster Square at Gates Circle is the first of several buildings proposed for the former hospital property, which is located at one of Buffalo’s most visible intersections where Delaware Avenue, Gates Circle and Lafayette meet. TM Montante Development will be building, over a period of years, both residential and commercial structures including a possible Tops Friendly Market. Negotiations with both Tops continue. Between TM Montante and Canterbury Woods respective investments, more than $150 million will be spent turning the land into a mixed-use community. With its price tag, the project is one the largest in Buffalo’s economic development pipeline. For the immediate future, TM Montante Development is focusing on the Lancaster Square at Gates Circle building. 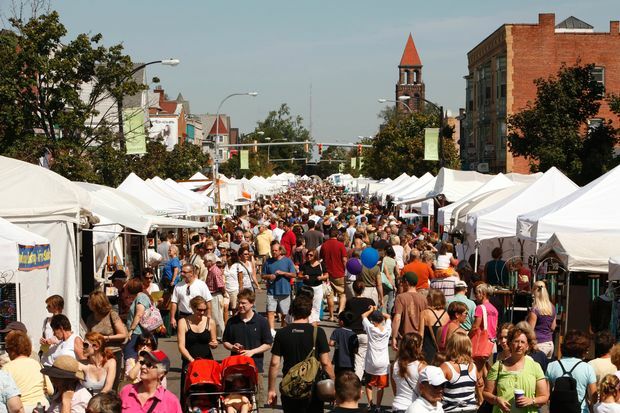 “It speaks to the neighborhood and the vibrancy we want to create,” Sunderhaus said. A six-story, brick-and-glass apartment building with 60 residential units and three first-floor retail spaces was approved Monday by the Planning Board. The plan by TM Montante Development and Morgan Communities of Rochester is part of the reuse of the former Millard Fillmore Gates Circle Hospital. The two developers have teamed up to create what they’re calling Lancaster Square, with the building at the northeast corner of Delaware and Lancaster avenues. It will feature a combination of modern homes, neighborhood retail and commercial office space. The $13 million project will include 45 single and studio apartments, with 15 two-bedroom units. Rents will range from $900 to $2,000. An existing 1970s parking ramp will need to be rehabilitated before it’s usable. Site preparation, including remediation, demolition and installation of infrastructure, totaled $14 million. This marks the third project on the site. Canterbury Woods is also constructing a six-story urban facility at 3 Gates Circle with 53 independent-living and five-assisted-living units. People Inc. is planning to build a 37-unit senior housing unit at 637 Linwood Ave. The Planning Board also recommended to the Common Council’s Legislative Committee that a large East Side housing project planned for the former Buffalo Forge Factory to be redesignated under the Green Code to accommodate the planned 159 mixed-income apartments, 25 town homes for sale, five single-family homes and retail space. The housing would front 490 Broadway, as well as along Mortimer and Sycamore streets. The site is part of the Brownfield Cleanup Program, which will make it eligible for brownfield tax credits for redevelopment. Kevin Beckman, who lives in Sycamore Village, enthusiastically endorsed the project. Remediation, which is expected to take five months and cost $3 million, including some pouring of foundations, could start in December, developer Stuart Alexander said. •The Planning Board also considered a 48,000-square-foot office building for Compeer East at 425 Michigan Ave. and Eagle Street. The board steered the architect to meet with a neighborhood block club and nearby church, and suggested returning on June 5 for further consideration. •Ellicott Development also got the green light to renovate a 40,000 square-foot building at 1941 Elmwood Ave., at the former Frontier Lumber site, for retail and warehouse space. •A 7,000-square-foot weld shop and repair garage was approved at 590 Elk St.
•A proposed auto repair shop at 822 Walden Ave., in a garage that had been used for storage behind a Dairy Queen, was not recommended by the Planning Board to the Common Council, which would have to approve a special permit for the building to be used. Montante acquired the 10-acre property from Kaleida Health, demolished buildings and built new streets. That has positioned the developers to start construction. The project includes up to 470 residential units, storefronts, offices, a fitness center and a grocery store. In addition, Canterbury Woods and People Inc. are erecting senior living facilities. Montante and Morgan have submitted plans for their first building, but still have to formulate other components, negotiate with the city and overcome financing hurdles. 1. Canterbury Woods: $41 million senior complex, with 53 independent-living and five assisted-living units. Status: The project, an urban version of Canterbury’s Williamsville community, is under construction on a 1.4-acre parcel. 2. Apartments and retail: $13.4 million, six-story building with three first-floor retail spaces and 60 market-rate apartments, a rooftop deck and some balconies. Status: Plans have been filed with the city. The proposal for the 67,000-square-foot building will be considered by the Planning Board on May 8. 3. Future buildings: Tentative plans call for a pair of large mixed-use buildings, with first-floor retail, commercial offices and residential units on the upper floors. Status: Still in flux. The eastern building will likely include a 25,000-square-foot grocery store. The location of a 50,000-square-foot fitness center is uncertain. 4. Homeopathic hospital: Adaptive reuse of 1911 hospital buildings in line with plans for the rest of the neighborhood. Status: Needs alternative financing after being rejected for historic tax credits because the rest of the hospital had been torn down. 5. Streets and parking: New roads, a central square, new infrastructure, landscaping and purchase of city ramp. Status: In progress. Montante extended Lancaster Avenue from Delaware to Linwood and connected it with a new road north to Lafayette Avenue. 6. People Inc.: $11 million, three-story building with 37 low-income senior housing units, on 1.1 acres across Linwood Avenue from main hospital site. Status: Approved by city. Construction set to begin in September or October on a vacant former hospital parking lot at 637 Linwood Ave.
Development partners TM Montante Development and Morgan Communities have unveiled the next building at Lancaster Square at Gates Circle. The development team is transforming the former Millard Fillmore Gates Circle Hospital site into a vibrant, urban place with new residential units, office space, and neighborhood retail. The six-story mixed-use building at the northeast corner of Delaware Avenue and Lancaster Avenue that will include retail on the ground floor and approximately 60 residential units on the upper floors. It comes after an extensive community outreach effort that included meetings with the Gates Circle Community Advisory Committee (CAC), area block clubs, and other local community groups and organizations. Beginning in the summer of 2016, the development team worked with the CAC as well as Robert Shibley and Bradshaw Hovey of the University at Buffalo’s Regional Institute to create a design review process for the building. This included both a competitive RFP for architecture teams as well as the input of a professional Design Review Committee. Importantly, the RFP also included a “Design Values Statement” that was developed collaboratively with the CAC and highlighted specific design considerations that respondents were required to address in their proposals. In December 2016 the development team selected BLTa, a Philadelphia based firm that has successfully designed mixed-use projects throughout the eastern United States, as architect. After the selection of BLTa, the development team re-engaged the community to elicit feedback on the new project. “The response from the community has been very positive. We’re hopeful that the Planning Board will determine that our site plan application reflects the significant amount of community collaboration and support,” said Campos. Work on the six-story building is expected to begin this summer. A proposed YMCA is no longer part of the Lancaster Square project that will include two additional mixed-use buildings on the site. TM Montante is still determining what will happen to the remaining hospital buildings that front Linwood Avenue. Plans to redevelop the historic structure did not qualify for Historic Preservation Tax credits. After more than two years of planning, TM Montante Development is prepping to bring its first building to the former Millard Fillmore Hospital Gates Circle campus. TM Montante, along with its Millard Fillmore development partner, Morgan Communities, has filed paperwork with the Buffalo Planning Board for a six-story, 67,000-square-foot building at the corner of Delaware Avenue and the Lancaster Avenue extension. The board will begin its review of the $13.5 million, privately-financed building on May 8. Construction could start this summer, said Christian Campos, TM Montante Development president. Work will start almost as Canterbury Woods is completing construction of its $43 million, 53-unit independent senior apartment complex, also on the former hospital site, and as People Inc. begins work on its 39-unit residential unit on a former hospital surface parking lot on Linwood Avenue. Taken together, the three projects are the first phases of a long-term, $200 million development investment on the former hospital property. “We always viewed this as transformational from Day One,” Campos said. The brick and glass building, designed by Philadelphia’s BLTa architecture firm, will feature first floor retail space and restaurant, and 60 apartments on its upper five floors. The apartments will range from studios to two-bedroom units. TM Montante has worked closely with neighborhood groups on its development plans for the Millard Fillmore site. Plans call for 531 residential units, ranging from Canterbury Woods’ apartments to market-rate apartments and townhouses, to be developed at various points on a 6.7-acre parcel that sits where Delaware Avenue intersects with Gates Circle and Lafayette Avenue. While it is expected that Tops Markets LLC will develop a 25,000-square-foot supermarket on the site, in one of the future mixed-use buildings, the YMCA of Buffalo Niagara has dropped its proposed 50,000-square-foot health center for the property. The YMCA is now considering other North Buffalo and Delaware District locations to replace its Delaware branch. “They just decided their needs were better served elsewhere,” Campos said. Campos said he hopes to find another health and wellness club to replace the YMCA. “Health and wellness is a key amenity,” he said. Development plans for the remainder of the hospital property remain a works in progress, Campos said. 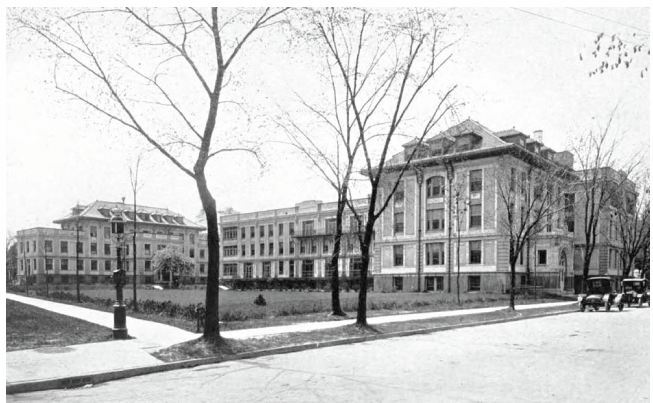 The original, circa-1911 homeopathic hospital, which remains and was not imploded with the remainder of the Millard Fillmore property in 2015, will likely be renovated into a residential-anchored project, although funding for that has not yet been secured. Two other mixed-use buildings will be developed, depending on tenant and market demands, officials said. In all, some 166,000-square-feet of office or commercial space may be developed on the site along with 136,000-square-feet of retail space that includes the Tops supermarket. TM Montante is still negotiating with the City of Buffalo to officially acquire the 750-space parking ramp that adjoins the property. Those talks should be completed soon, Campos said. A project to create a new neighborhood at Gates Circle will begin with a six-story, brick-and-glass apartment building with first-floor retail, balconies and a rooftop patio. But the larger development around it will no longer include the YMCA, which has withdrawn from the project. Meanwhile, the developers are still trying to buy an adjacent 750-space parking ramp from the city. And the future of the century-old former homeopathic hospital building that still stands on the site is less certain, after the developer failed to qualify for historic tax credits that were critical to the financing. Those are some of the new details that emerged Tuesday, as partners TM Montante Development and Morgan Communities of Rochester kicked off their reuse of the former Millard Fillmore Gates Circle Hospital site by formally filing plans with the city for the first building. The project will be considered by the Planning Board on May 8. The new details reveal progress in some areas but false starts in others. And they show just how complex the entire effort will likely be. Developers Thomas Montante and Robert C. Morgan have teamed up to convert the sprawling property into what they’re calling Lancaster Square, described as a “vibrant, mixed-use urban place” with a combination of modern homes, neighborhood retail and commercial office space. The developers already own most of the 10-acre site, which Montante purchased from Kaleida Health in December 2013 after the hospital closed. 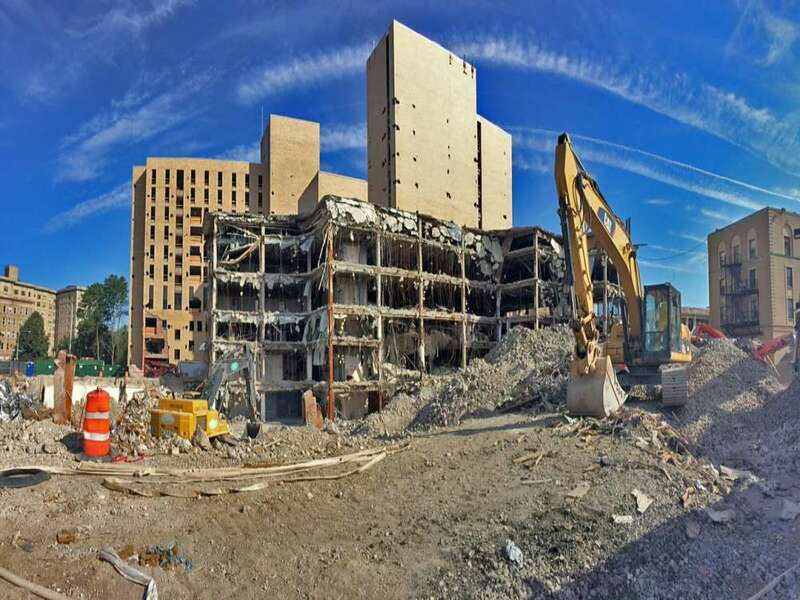 Crews demolished most of the structures – including imploding the 10-story main hospital building – and then spent months clearing the site and cleaning it of environmental contamination. Only the original 1911 homeopathic building still stands. Plans call for $150 million in new development that would include up to 531 condominiums, market-rate apartments and townhomes, as well as a grocery store, fitness club, some commercial office space and other ground-floor retail storefronts. That doesn’t include the costs of the $41 million Canterbury Woods senior housing community at Gates Circle or the $11 million People Inc. senior facility on Linwood Avenue nearby. “We’ve been viewing this as a transformational project since day one,” Campos said. Canterbury Woods, the suburban senior community run by Episcopal Church Home & Affiliates, is constructing a six-story urban facility at 3 Gates Circle, with 53 independent-living and five assisted-living units. The nonprofit, which has a long waiting list for the apartments, already acquired its 1.4 acres of land from Montante and will operate separately. People Inc. has also received approval late last year to build a 37-unit senior housing complex on a 1.1-acre vacant former hospital parking lot at 637 Linwood Ave.
That leaves 5.3 acres still under the developers’ control at the main hospital site, plus a separate 2-acre parking lot that stretches from Lafayette to West Delavan avenues. The proposal filed Tuesday would mark the third project on the site, but the first by Montante and Morgan, whose firm joined the development team in late March, bringing its experience with apartment development and management, as well as its financing contacts. Morgan’s Pittsford-based company owns and manages more than 180 properties in 14 states. As initially announced in early March, the new proposal calls for a six-story building on the northeast corner of Delaware and Lancaster avenues with about 60 market-rate apartments and at least three first-floor retail spaces. Plans call for the 67,000-square-foot brick-and-glass building to feature 10 studio apartments of 600 square feet each, 35 one-bedroom apartments of 650 square feet and 15 two-bedroom units with 1,200 square feet in each. Rents have not been finalized. The new building would be located on Lancaster Square, a new public space Montante is creating at the heart of the main site. That’s also just north of the new Lancaster Avenue extension, a road built by Montante that stretches the existing street from Delaware to Linwood avenues. The new street isn’t yet open to the public. Besides standard bank construction and permanent loans, the developers plan to pursue various government incentives to help pay for the $13.4 million building, although they have not yet determined what they will seek. The redevelopment would also qualify for state brownfield tax credits. The Planning Board filing comes after extensive community outreach efforts by Montante and Morgan, including discussions with the Gates Circle Community Advisory Committee, area block clubs and other community groups. Montante, which began the planning last summer, also worked with Robert Shibley and Bradshaw Hovey of the University at Buffalo’s Regional Institute to develop a process for reviewing the design with the community, including a values statement. That effort appears to have paid off, as at least one neighborhood leader said she will back this project with a personal letter of support. “The process used by TM Montante to engage with the community in a meaningful way should be used as a model for other development projects in the city,” said Gretchen Cercone, president of the Lancaster Avenue Block Club. Officials hope to start construction at the beginning of summer, with about 12 months of work before completion. The Lancaster Square concept also envisions two more large buildings on the site, with ground-floor retail, a layer of commercial office space above that and residential units on the upper floors. The developers also hope to sign an agreement with the city within the next few months to buy the parking ramp on Linwood, Campos said. Crews will then stabilize and upgrade it. But not everything is going as planned. Officials are now seeking other funding options for the homeopathic building project, after months of talks with the National Park Service and State Historic Preservation Office led nowhere because so much of the larger hospital complex had already been demolished. Campos also said the YMCA – which had earlier signed a letter of intent to participate in the project – had notified the developers that it was “no longer considering the site” for its North Buffalo needs, after hiring a consultant to evaluate options. YMCA spokesman Geoff Faulkner said the decision was based on a study of market demographics, membership and service areas. No company has agreed to operate the grocery store yet. Campos said the team is still planning to include a fitness center in the project, and continues to talk with Tops Markets and other stores. Discussions have also begun with other commercial tenants, who are attracted not only by the convenience to the Buffalo Niagara Medical Campus but also to downtown and the Elmwood Village. Three years after taking over the sprawling former hospital property at Gates Circle with plans for an ambitious residential project, TM Montante Development is bringing in a Rochester apartment manager and developer to turn the concept into reality. Thomas Montante’s firm is teaming up with Robert C. Morgan, whose Pittsford-based company owns more than 180 properties in 14 states. The two developers will work together to create Montante’s proposed Lancaster Square at Gates Circle, which envisions more than 500 apartments, townhomes and condominiums – plus neighborhood retail and commercial office space – on the site formerly occupied by Millard Fillmore Gates Circle Hospital. “This is such a big transformational project, that we always knew it was going to be important for us to bring in the right partner to be able to truly transform the site and move forward with our vision for the development,” said TM Montante President Christian Campos. The joint venture will mark the biggest and most visible initiative in Buffalo to date by Morgan Communities. It will give Montante – a much smaller developer by comparison – better access to the financing he needs as he prepares to submit his first building to the city Planning Board in the coming weeks. The multi-year project is designed to produce a new mixed-use, urban neighborhood – complete with a fitness center, a grocery and new streets. It’s estimated to cost more than $110 million, not including the $41 million Canterbury Woods senior-living facility now under construction with 53 independent-living and five assisted-living units. Montante on Friday sold its Gates Circle properties at 1285, 1291 and 1299 Delaware Avenue, 865 Lafayette Avenue and 630 Linwood Avenue to a new equal joint-venture called Montante/Morgan Gates Circle LLC, which is registered to Morgan’s Pittsford headquarters. The purchase price was $4.7 million, according to Erie County Clerk records. “The trend for major development projects in Buffalo and nationally is for developers to work in partnership to bring greater resources to the table,” said Matthew Montante, chief operating officer of his father’s company. Before choosing Morgan, Montante said his company “took great care and diligence” in evaluating a partnership with another developer and also considered how to best use a joint venture to advance the project. The two developers were introduced to each other by a mutual personal friend and discussions began last summer. “While several development groups approached us about collaborating on the Lancaster Square project, we felt that Morgan Communities shared our vision for design and neighborhood connectivity,” Montante said. Morgan Communities, owned by Morgan Management, is a family-owned real estate company that invests in apartments, manufactured housing, recreational vehicle housing and self-storage facilities around the country. Founded in 1979, the company currently owns more than 32,000 units, with particular concentrations in the Rochester and Pittsburgh markets. The firm has already completed urban redevelopment projects in historic parts of Pittsburgh, Cleveland and Rochester, including the Eastside Bond Apartments in Pittsburgh and the transformation of the former Midtown Tower in Rochester into the mixed-use Tower 280. This will be the firm’s first major venture in Buffalo, although Morgan already owns and operates several apartment complexes in Buffalo and its suburbs, including Raintree Island and Paradise Lane in Tonawanda, Maplewood Estates in Hamburg, Idlewood Apartments in Cheektowaga, and Green Lakes Apartments in Orchard Park. In all, the firm has about 4,000 units in and around Buffalo, including many owned in partnership with Glendale Development’s Matthew Cherry. It also bid for One Seneca Tower early in the foreclosure process, but backed away before Douglas Jemal’s Douglas Development Corp. emerged last summer as the buyer. 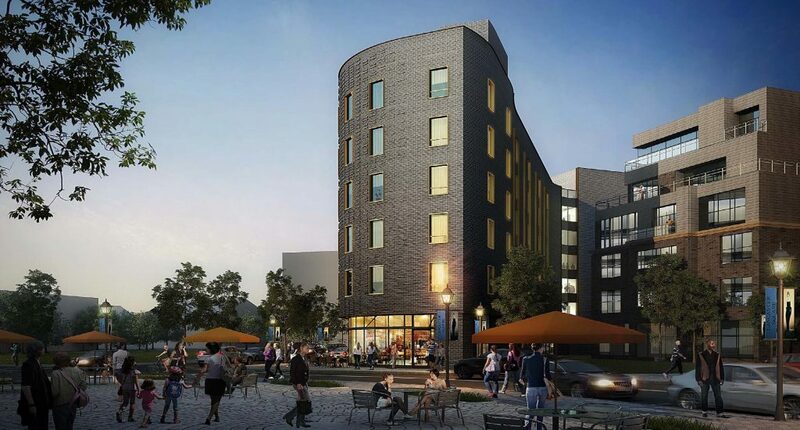 The announcement comes just three weeks after Montante unveiled its first proposed new building for the site, a six-story apartment building with retail space on the northeast corner of Delaware and Lancaster avenues. Plans tentatively call for at least three retail spaces on the first floor, such as for a restaurant or cafe, with the one- and two-bedroom apartments upstairs. Details are still being finalized, and Montante expects to submit the proposal for municipal review in the spring. Montante has been working for three years to reuse the 6.7-acre hospital site, which it acquired from Kaleida Health after the hospital was closed and consolidated downtown to the Gates Vascular Institute. 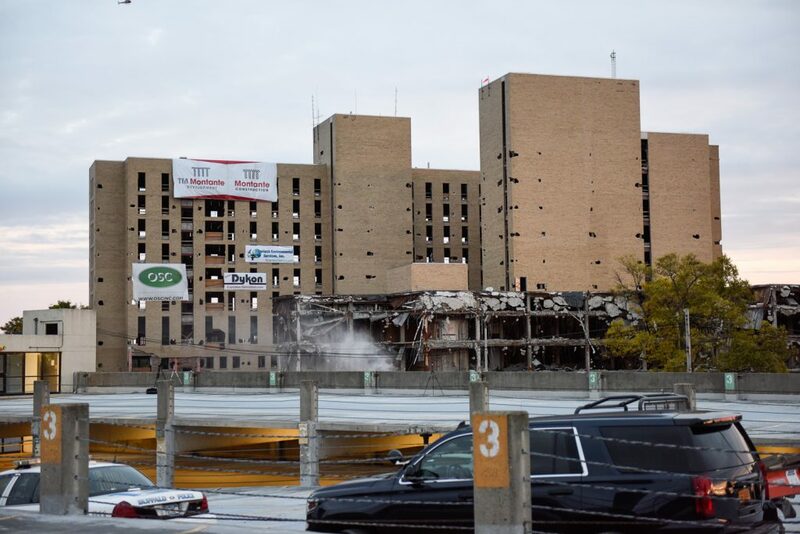 The former buildings have already been demolished – including the implosion of the 11-story main hospital – and crews have since focused on clearing, cleaning up and preparing the site for redevelopment, which is expected to last five to seven years. Canterbury Woods, the suburban senior community run by Episcopal Church Home & Affiliates, already bought the land for its project, located at 3 Gates Circle. People Inc. is also buying a 1.1-acre vacant former hospital parking lot from Montante at 637 Linwood, where it will build a separate 37-unit senior facility. It received approval late last year. Gates Circle, meet Lancaster Square. The developer that owns most of the former Millard Fillmore Gates Circle Hospital land is proposing its first new construction project at the site — more than 38 months after taking ownership of the sprawling property. TM Montante Development wants to construct a six-story mixed-use building on the northeast corner of Delaware and Lancaster avenues, with a blend of residential and retail space. It’s the initial step in the creation of a larger neighborhood development that the firm is calling Lancaster Square, after the street that runs through it, said Christian Campos, Montante president. The structure would include at least three first-floor retail spaces and about 60 market-rate apartments on the upper floors. Sizes and rents have not been set, but about 70 percent of the units would be one-bedroom apartments, while the rest would have two bedrooms, Campos said. He said Montante is looking for a restaurant, cafe and other “neighborhood-scale” retail users for the first-floor space, but doesn’t have any leases firmed up. The long-anticipated project would be Montante’s first in that area. It would mark the third overall on the site. Canterbury Woods, the suburban senior community run by Episcopal Church Home & Affiliates, is constructing a new six-story urban facility at 3 Gates Circle, with 53 independent-living and five assisted-living units. The non-profit, which has a long waiting list for the apartments, already acquired its land from Montante. Separately, People Inc. received approval late last year to build a 37-unit senior-housing complex on a 1.1-acre vacant former hospital parking lot at 637 Linwood Avenue. It has the land under contract to acquire from Montante, but has not yet closed on it. That leaves 5.3 acres under Montante’s control at the main hospital site, plus a separate two-acre parking lot that stretches from Lafayette to West Delavan avenues. 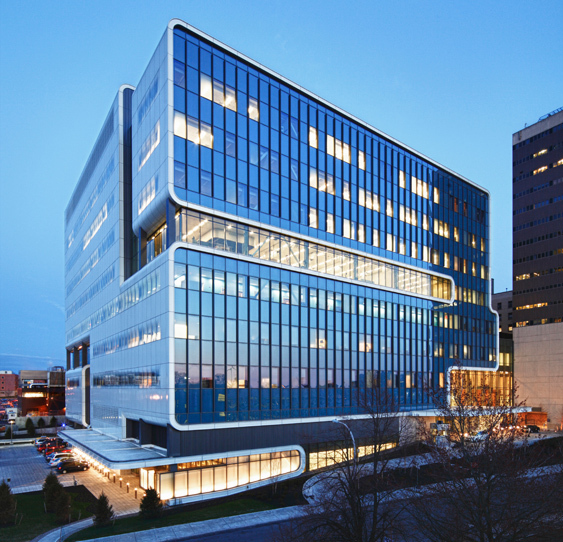 Montante emerged almost four years ago as the winning bidder for the right to redevelop the Gates Circle hospital, which had already been closed and consolidated into the Gates Vascular Institute next to Buffalo General Medical Center. The developer proposed to create what it calls “a vibrant, mixed-use urban place” on the site, with a combination of modern residential, neighborhood retail and commercial office space. Plans called for up to 500 condominiums, market-rate apartments and townhomes, as well as a grocery store, fitness club and other ground-floor retail storefronts. The initial proposal also included the Canterbury Woods component. Montante took down most of the old buildings mechanically after cleaning out asbestos and other hazardous materials, and then imploded the 10-story main hospital building in dramatic fashion. That was followed by a full-scale cleanup and clearing of the site, in preparation for the redevelopment. The proposed building would be located on Lancaster Square, a new public space that Montante is creating at the heart of the 6.7-acre hospital site that it acquired from Kaleida Health in December 2013. It’s also just north of the new Lancaster Avenue extension, a road built by Montante that stretches the existing street from Delaware to Linwood avenues. The new street isn’t yet open to the public. But, the first phase of the roadwork is complete. Crews finished installing the subsurface utilities at the end of last year, along with the curbs and a binder layer of asphalt, Campos said. But workers still need to put down the top coat of blacktop, plus the sidewalks and landscaping, later this year, he added. An additional connector road will run from Lancaster to Lafayette Avenue. The total cost of the 60,000-square-foot building has not been finalized, but Campos said it would likely be financed using standard bank construction and permanent loans. The redevelopment would also likely qualify for state brownfield tax credits. The developer is now working over the next month to introduce the concept to the community and various neighborhood or block clubs. Officials met this week already with the Community Advisory Committee that has been guiding the redevelopment process for the past three years, and will start rolling it out to others in coming weeks. Officials have not yet submitted formal plans to the city for review, but expect to seek site plan approval in the spring. No zoning variances are required. They hope to start construction at the beginning of summer, with about 12 months of work before completion. The developer selected Philadelphia-based BLTa as the project architect. BLTa will also work with local firms, including C&S Engineers, M/E Engineering and Siracuse Engineers. Montante Construction will oversee the actual job. With its site preparation, road and infrastructure work nearly complete, TM Montante Development is beginning to shift its focus to building out the former Millard Fillmore Gates Circle Hospital property. Plans call for the first building, a gateway structure into the redeveloped hospital campus, to be constructed, with work beginning perhaps as early as this summer. TM Montante officials confirmed the first structure, set for the northeast corner of Delaware Avenue and the soon-to-be christened Lancaster Avenue extension that will cut through the property. The six-story, 60,000-square-foot building will house neighborhood retail and restaurant space on its first floor and 60 market-rate apartments — a mix of one-bedroom and two-bedroom units — spread on its upper five floors. Christian Campos, TM Montante Development president, said 70 percent of the units will be one-bedroom apartments and the remaining 30 percent will be two-bedroom units. TM Montante Development has dubbed the complex Lancaster Square at Gates Circle, partially because it will overlook the Lancaster Square, a public gathering location within the former hospital property. A price tag for the building is still being estimated, Campos said. The cost, though, is expected to be north of $100 per square foot. The final design is still being drawn up. Campos said his company will hold meetings with surrounding neighborhood groups to review the project. After those meetings are conducted, TM Montante Development will submit the building’s plans to various Buffalo agencies for review. That will likely happen later this spring. Lancaster Square at Gates Circle is located at the nearly eight-acre former hospital property. TM Montante Development will be building, over a period of years, both residential and commercial structures including a possible YMCA branch and a Tops Friendly Market. Negotiations with both the YMCA and Tops continue, Campos said. In addition, Canterbury Woods is expected this fall to open its 51-unit senior apartment complex on a portion of the hospital property that it bought from TM Montante Development. Between TM Montante and Canterbury Woods respective investments, more than $150 million will be spent turning the land into a mixed-use community. Campos said the project has already generated a fair amount of buzz from prospective retail and restaurant tenants as well as those interested in the apartments. “When we say retail or restaurants, we are talking about small scale options that will fit into the neighborhood,” Campos said. The building was designed by BLTa, a Philadelphia-based firm that responded to an RFP issued by TM Montante Development. The project is the firm’s first in Buffalo. 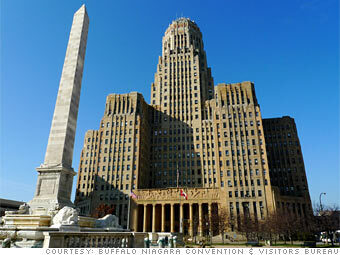 “We are working with a firm that recognizes the importance of Buffalo’s architectural heritage,” Campos said. BLTa will be working with a number of local firms on the project including C&S Cos., M/E Engineering, and Siracuse Engineers. Montante Construction will manage the construction. Campos said he hopes to start work this summer. TM Montante Development has announced the next development project at Gates Circle will be a six-story mixed-use building that will include several retail storefronts on the ground floor and approximately 60 market rate residential units on the upper floors. BLTa, a Philadelphia firm with extensive mixed-use design experience, has been selected as project architect. The building represents a significant milestone in the transformation of the former Millard Fillmore Gates Hospital into Lancaster Square at Gates Circle, a mixed-use, urban place featuring neighborhood retail, residential units, and commercial office space. Since acquiring the site from Kaleida Health, TM Montante Development has worked collaboratively with the community to develop the overall vision for Lancaster Square at Gates Circle, and is now actively engaging its Community Advisory Committee as well as neighborhood block clubs on this new building project prior to site plan review. TM Montante Development will present the project renderings to the public later this spring. BLTa was selected as architect after a competitive RFP process. Importantly, the RFP included a “Design Values Statement” that was developed collaboratively with the community and highlighted specific design considerations that respondents were required to address in their proposals. The process to select the project’s architect also included input from a professional design review committee that evaluated all proposals within the context of the Design Values Statement. BLTa will be working with several area firms on the project, including C&S, M/E Engineering and Siracuse Engineers. Montante Construction will manage construction of the new building and its preliminary schedule has shovels in the ground later this summer. TM Montante Development has converted this building along Gates Circle into two apartments and office space. A pair of luxury apartments in a century-old private residence marks another sign of TM Montante Development’s transformation of properties near the now-closed Millard Fillmore Gates Circle Hospital. TM Montante has turned a portion of the house, located at 40 Gates Circle and just across Lafayette Avenue from the former hospital site, into two apartments. TM Montante is using a portion of the building’s first floor for sales and marketing office. The larger of the two apartments has 2,040-square-feet and includes three bedrooms, a working fireplace, den and offers views of Gates Circle. The second unit, a one-bedroom unit, has 780-squate-feet. An open house for both is set for 11:30 a.m., Jan. 24. TM Montante is in the early stages of turning the Millard Fillmore Gates Circle Hospital into the Lancaster Square, a mixed-use urban complex with neighborhood retail including a possible supermarket, various residential units, commercial and medical office space. Amenities include a center, community square and the extension of Lancaster Avenue from Delaware Avenue to Linwood Avenue. Canterbury Woods is also developing an independent senior apartment complex on the property that’s due to open later this year. Between Canterbury Woods and TM Montante’s projects, more than $140 million is being invested to transform the hospital property. People Inc. got the green light Monday night from the Buffalo Planning Board for a proposed new senior housing project at Gates Circle, after multiple meetings with community members and the city’s Historic Preservation Board led to changes that addressed prior design concerns. The Amherst-based social services nonprofit is seeking to build a 37-unit facility at 637 Linwood Ave., seeking to meet a growing demand for aging-in-place housing options in the city. The three-story building would be constructed on a small part of what was once the Millard Fillmore Gates Circle Hospital site, on a 1.1-acre vacant former hospital parking lot which People Inc. would acquire from TM Montante Development. The project, which also covers 907 and 911 Lafayette Avenue, includes 37 parking spaces for the tenants. The project previously met with some resistance in the neighborhood, led by the Linwood Preservation District & Friends, but officials from People Inc. and architects from Long & Associates met three times each with community members, the Gates Circle Advisory Committee and the Buffalo Preservation Board, ultimately winning the latter’s approval. With the Planning Board approval in hand, officials now plan to apply for funding from New York State Homes and Community Renewal’s Housing Trust Fund Corp. as part of the project’s financing. The proposed 38-foot tall facility at the southeastern corner of Linwood and Lafayette is completely separate from the six-story Canterbury Woods senior housing project that is now under construction nearby, right on the circle at Delaware Avenue. That’s the anchor project for the overall redevelopment of the 6.9-acre hospital site. Plans by architect Matthew Long show the three-story People Inc. building would consist of 31 one-bedroom units of 700 square feet each and six two-bedroom apartments of 925 square feet each, plus private porches and greenspace. The apartments are intended for seniors aged 55 and over, with incomes ranging from 30 percent to 130 percent of the area median, or $16,000 to $75,000. Neighbors previously cited a desire for the new project to look more like individual homes rather than a single large monolithic building, so officials modified the facade design, added landscaping, changed the roof style and reduced the number of units from 42 originally. Officials hope to start construction in September or October of next year, followed by a year of work before it opens. 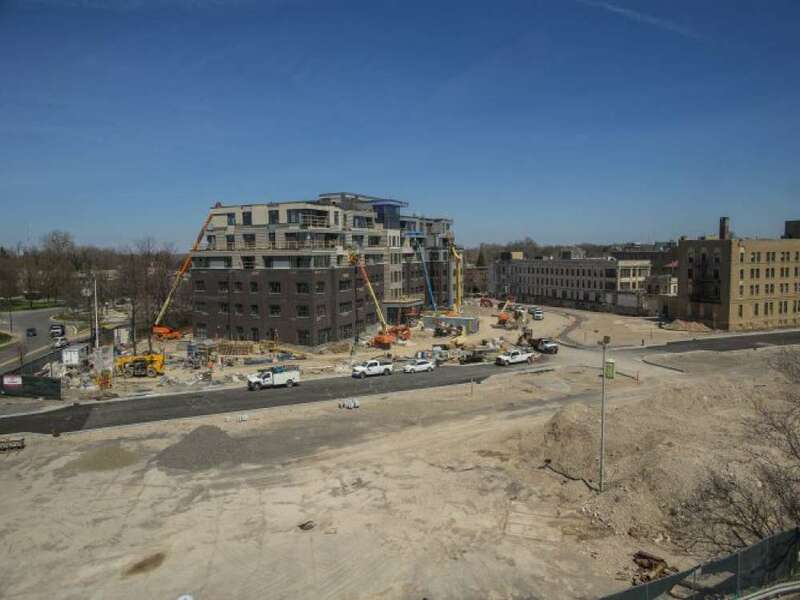 The look of Buffalo’s Gates Circle has changed drastically, as the new Canterbury Woods senior housing rises on the site of the old Millard Fillmore Hospital. An even larger project is now starting on the site. The former hospital site is dominated by the rising Canterbury Woods building, as contractors race to get it closed in before more cold weather hits. On one side of it is work on the over-arching project, the TM Montante development now called Lancaster Square. Montante Public Affairs Director Byron Deluke says a lot of work has to be done in site preparation. “Water, sewer, electrical, gas and then also, of course, some of the site work, leveling and moving soils around that leads to the installation of curbs, the eventual street itself, sidewalks and eventually all of the pedestrian-friendly measures like pedestrian bumpouts, trees, green space,” he said. The work also includes installation of new utility lines for future buildings. Eventually, they will be covered by roads. That work will probably be finished in spring, Deluke said. “Setting the table for Lancaster Square, the development and, of course, is going to lead to two new roads, one of which the extension of Lancaster between Delaware and Linwood, the Public Square – the pedestrian square at the middle of the site – and then also a connector road that’s going to go from that Public Square up to Lafayette,” he said. The roadways are a $10 million project, with Albany kicking in $2 million of that. Meanwhile, Montante is still meeting with City Hall about buying the adjacent parking ramp, essential to having enough parking space. People Incorporated is working on its planned 40 units of affordable housing on a former hospital parking lot along Linwood. After push back from neighborhood residents, People Inc. has returned with a revised design for its senior apartment project at the southeast corner of Linwood and Lafayette avenues. The three-story building will include 37 one and two-bedroom apartments ranging from 700 to 925 square feet. There will be a small community room with kitchenette at the main level of the building and parking for 37 cars at the rear. A previous design with prominent bay windows has been replaced with one that has stacked patios. The project is designed by Long Associates Architects. It will occupy a surface parking lot that was part of the Millard Fillmore Gates Hospital site. Infrastructure work, a key element to the redevelopment of the former Millard Fillmore Gates Circle site, continues to advance with the financial backing of a Empire State Development. The state agency allocated $2 million that will help finance a $10 million Lancaster Square infrastructure project that’s central to the redevelopment of the former hospital site currently underway by the TM Montante Development Group. The funds came from a recommendation made by the Western New York Regional Economic Development Council. TM Montante is in the middle of building a Lancaster Avenue extension through the property that will run from Delaware Avenue east to Linwood Avenue. The project also includes a side street cutting through the property and a public square. “It is designed to provide easy access to all of the exciting services and amenities we’re bringing to the site in the coming years,” said Matthew Montante, TM Montante chief operating officer. TM Montante’s plans call for a series of buildings to be developed on the site including those housing residential units, offices and some retail options. Talks are underway to bring a supermarket and YMCA branch to the property. Separately, a 58-unit Canterbury Woods independent senior living complex is under development on the site. The face of Gates Circle is rapidly changing. The site is currently transitioning from a historic Olmsted roundabout flanked by a dated hospital, to a currently super banged up Olmsted roundabout, flanked by a six-story, $41 million independent-living apartment building. Once finished in Fall of 2017, Canterbury Woods Gates Circle will house 53 apartments. TM Montante Development is redeveloping the balance of the former Millard Fillmore Gates Hospital site into a mixed-use urban district. The project is expected include a grocery store, parking garage, a health and wellness center, 500 residential apartments and condominiums, office, and retail space. A second residential building component at the Gates Site was recently unveiled. The three-story, 40-unit apartment building will house low-income seniors. The development has been proposed by People Inc. on a former hospital parking lot located at the southeast corner of Linwood and Lafayette avenues. Montante has also refined the master plan for its portion of the site and given it a new name: Lancaster Square. The idea behind the development as a whole is to create a mixed-use urban district, filled with new builds and adaptive reuse of existing buildings (see diagram above). The Lancaster Avenue extension will act as a center for bustling activity within the complex, featuring Lancaster Square at the heart. According to Montante, historic buildings at the northeast corner of the site will be incorporated into the plan. Specifics on the new buildings proposed for the project are expected to be released soon and construction is expected to start on the Montante’s first phase next year. People Inc. is taking the next step toward building a 39-unit affordable housing facility for seniors on Linwood Avenue at Gates Circle. 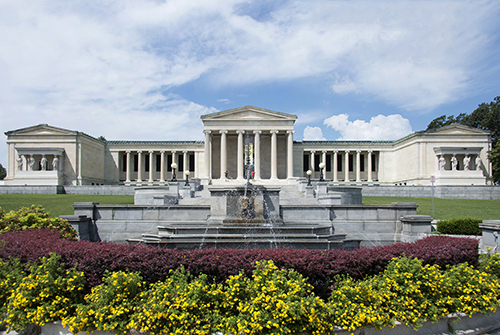 After several meetings with neighborhood groups, the organization will present its plans to the City of Buffalo Preservation Board, which reviews landmark properties within preservation districts. The $11 million project includes a three-story brick building that will blend in with the surrounding residential neighborhood. It will include five 2-bedroom units and 34 one-bedroom apartments for individuals ages 55 and older. The facility will also include several set-aside units for individuals with disabilities. Contingent on funding and tax credits from the state, People Inc. has signed a purchase agreement with TM Montante Development, which is developing a mixed use community at the former Millard Fillmore Gates Circle Hospital. Also under development at the site is a Canterbury Woods continuing care retirement community (CCRC), by Episcopal Church Home & Affiliates of Western New York. People Inc., a $140 million nonprofit that provides residential services for seniors and individuals with developmental disabilities, is working with Long Associates for architecture services. Rhonda Frederick, CEO, said input from the neighborhood was integral to the design. Plans call for keeping a neighborhood playground adjacent to the parcel in place, possibly with some improvements. The 38,000-square-foot facility would be People Inc.’s 20th senior housing complex in the region and its third in the city, joining Ivy Rose Housing on Hertel Avenue at Virgil; and Seneca-Cazenovia Community Square in South Buffalo. Like its other sites, Frederick expects the residents would likely come from the surrounding neighborhood: More than 90 percent of residents at its existing 19 sites come from a home within a five-mile radius. The next shoe is about to drop at Gates Circle, as the second project proposed for the former hospital site is now bubbling to the surface. Social services agency People Inc. is developing plans for a new low-income residential complex for seniors aged 55 and over, to be located on a former hospital parking lot at the southeastern corner of Linwood and Lafayette avenues. Specific plans are still in flux, but agency officials have talked with community residents about a three-story, 40-unit apartment building as a preliminary concept. Rents would be aimed at those households with incomes between 30 percent and 130 percent of the area median, adjusted for size, while six units would be set aside for those with disabilities, officials have told neighbors, including members of the Gates Circle Advisory Council. Tentative plans at one point called for 34 one-bedroom apartments and six two-bedroom units. “We are very excited about this project as it adheres to the overall goals of the redevelopment of the Gates Circle site of creating a vibrant and mixed-use development connecting diverse neighborhoods in one of most historic areas in the city of Buffalo,” Wells said in an emailed statement. The site is located just north of the Linwood Historic Preservation District, which may trigger review of any project by the city Preservation Board and Common Council, as well as by the Planning Board. People Inc. officials have indicated to neighbors that they are aware of that status, and will be respectful of community concerns on issues like appearance, aesthetics and design. The agency told community members it also plans to apply for state low-income housing tax credits to help with financing. Officials are hoping to set up additional meetings with community groups and neighbors soon. So far, however, no plans have been filed, and Ellicott District Councilmember and Council President Darius Pridgen said he was not yet aware of any project. The proposed new project comes as construction continues on the first piece of redevelopment taking place on the Gates Circle site: Canterbury Woods. Episcopal Church Home & Affiliates is building a second campus for its successful senior continuing care community, with 53 independent-living apartments and five assisted-living units in a six-story building on 1.4 acres fronting on the circle. Officials broke ground on the $41 million project in May, and expect to finish in late 2017. The company already has 130 reservations for apartments. No other specific projects have been proposed as yet, but Montante has said it plans upwards of 500 apartments, condominiums or townhouses spread across multiple buildings, plus a grocery store, fitness club and ground-floor retail space. Montante officials have been seeking to line up Tops Markets and the YMCA as tenants, but neither has finalized intention to do so. The Common Council is set to approve a new special zoning district for a Gates Circle property that already has been endorsed by the city Planning Board. The Planning Board approved the plan Monday despite the threat of a lawsuit by attorneys for Canterbury Woods Retirement Community, who were pushing for a six-story cap on the height of any new building next to its new senior community. The community’s plan now includes a 10-story cap. Then, on Tuesday, the Council’s Legislation Committee supported the new zoning plan, despite complaints from a few residents that it hadn’t been fully vetted by neighborhood residents. After a public hearing last month, when residents asked for some changes in the plan, Council President Darius G. Pridgen, who represents the Ellicott District, and Delaware Council Member Joel Feroleto amended the proposal to address resident concerns about parking and building height. The amended plan prohibits parking lots in front of structures along Lancaster, Delaware or Linwood avenues. It also requires buildings to be at least two stories high but no more than 10 stories. The two-story provision was included because residents were concerned the original plan would have permitted one-story strip plazas. The 10-story provision opposed by Canterbury Woods was in the original proposal. Lancaster Avenue resident Daniel R. Sack told the committee Tuesday that many neighborhood residents aren’t aware of the latest proposed changes, and asked that the Council table the measure to give the community time to review the amended plan. But Feroleto said he has remained in contact with neighborhood leaders, who are aware of the changes – which, he noted, were made at the request of the neighborhood residents. The Council committee is recommending that the full Council approve the amended Gates Circle zoning district at its meeting Tuesday. The new code covers the 6.7-acre property that was the former site of Millard Fillmore Hospital. The amended zoning district regulations were presented to the Planning Board on Monday by Marc Romanowski, attorney for TM Montante Development, which owns the site. Romanowski endorsed the proposed changes, which he called “a couple of further minor tweaks” to address neighbors’ concerns. However, planners did not agree to lower the maximum height from 10 stories to six for development adjacent to the six-story Canterbury Woods facility now under construction at the front of the site. That was a disappointment to Episcopal Church Home & Affiliates – the owner and sponsor of Canterbury Woods – which previously threatened to sue the city to force such a change. Episcopal Home officials say a 10-story building would infringe on their residents’ views and sunlight, and diminish the living arrangements they were expecting. “Canterbury Woods views this as incompatible with our project and detrimental to the many residents who are going to live at Canterbury Woods,” said attorney Patrick T. Fitzgerald of Phillips Lytle LLP. Attorneys for TM Montante and Episcopal Home had aired their differences at prior meetings of the Planning Board and the Legislation Committee, but to no avail. The Planning Board, at its last meeting, had directed the two sides to work out their differences on their own, but they “didn’t make any progress,” Romanowski said. Construction is finally set to begin on the $41 million Canterbury Woods senior citizens facility at Gates Circle in Buffalo, now that the owner of the retirement community has officially completed its acquisition of a 1.4-acre property on Delaware Avenue. Episcopal Church Home & Affiliates paid $4.8 million to buy the site facing Chapin Parkway from TM Montante Development, which had acquired the 6.7-acre former Millard Fillmore Hospital complex from Kaleida Health. The purchase clears the way for work to start on the six-story signature building, which was approved by the Buffalo Planning Board in January. Spokesman Philip J. Pantano said preparatory work and scheduling will start “immediately,” with physical activity beginning over the next few weeks. Work by Lecesse Construction and its subcontractors will last about 18 to 20 months, with the first residents slated to move in late in 2017. Plans for the first urban continuing-care retirement community in the state call for 53 independent-living apartments and five assisted-living units, in a prominent location fronting Gates Circle. So far, more than 130 people have put down reservations on a priority list for the new apartments. The Canterbury Woods project, although independently owned, developed and operated, is part of the larger redevelopment of the Gates Circle site by TM Montante into more than 500 residential apartment, townhouse and condominium units, as well as a fitness facility, a grocery store and additional retail or office space. Redevelopment of the remainder of the site is expected to take several years, Montante officials have said. The original Canterbury Woods in Amherst opened in 1999, providing a spectrum of aging-in-place care for senior citizens 62 and older, including independent living, assisted living, skilled nursing and rehabilitative services. Episcopal Church Home has been providing health care and related services in Western New York since 1858. 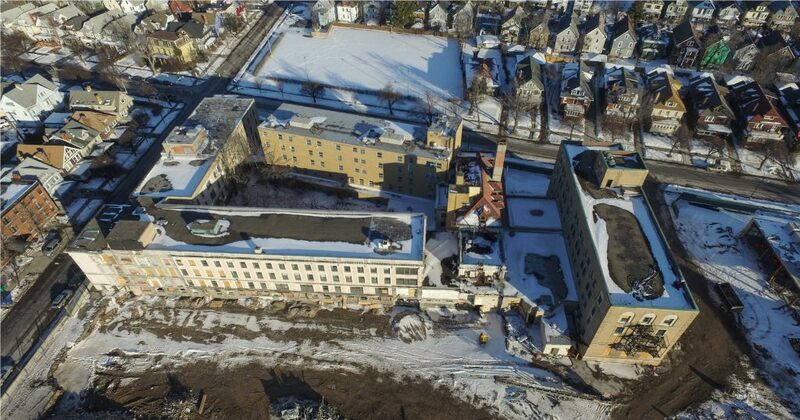 TM Montante Development finished the environmental cleanup of the former Millard Fillmore Gates Circle Hospital property under state supervision, enabling a sprawling $150 million redevelopment project to move forward on the prominent site, officials reported. The Department of Environmental Conservation late Wednesday announced the completion of the multi-million-dollar project to remove contamination from the affected parcels at 3 Gates Circle under the state’s Brownfield Cleanup Program. Once it receives final approval, the report will be available for public viewing. And as long as Montante continues to comply with the cleanup agreement with the state, the developer would be eligible to receive the brownfield cleanup tax credits to offset qualifying remediation and construction costs, with no future liability to the state for pollution. According to the summary report, Montante’s crews excavated and disposed of about 1,520 cubic yards of soil that was contaminated with fuel oil, and also dug up and disposed of about 1,090 cubic yards of soil and fill polluted with polycyclic aromatic hydrocarbons and mercury. That enabled the developer to meet the required objectives for residential cleanup. Montante also placed a cover system of soil, crushed stone, existing asphalt-covered areas and concrete building slabs across the site, with at least a two-foot thickness of soil on top of an orange-mesh “demarcation layer” to separate it from any remaining contamination. The property also now includes an environmental easement limiting its use to restricted residential, commercial or industrial operations. Montante also instituted a “site management plan” laying out how the remaining contamination will be managed and a separate “excavation work plan” to ensure future activities at the site are “completed in a safe and environmentally responsible manner.” The developer also must certify annually that the institutional and engineering controls are in place and working. The certification will mark the end of the first stage of converting the former healthcare complex, which was vacated by Kaleida Health after it closed the hospital in 2012.. After a failed first attempt to sell the property, Kaleida awarded the site to Montante, which proposed an ambitious redevelopment of the 6.9-acre property into a new mixed-use community, in conjunction with Episcopal Church Home & Affiliates’ Canterbury Woods. The project by the two companies will feature more than 500 residential units, including a 58-unit continuing-care senior facility and a blend of market-rate apartments, townhomes and condominiums. Plans also include a fitness club, an urban grocery, ground-floor retail space, and possibly some additional commercial space, spread among multiple buildings. The new $40 million urban Canterbury Woods, which has 142 people on a waiting list, will have 53 independent-living apartments and five assisted-living units, plus shared tenant space, in a six-story building. It will anchor the overall project and be completely separate from the rest of the Montante project. 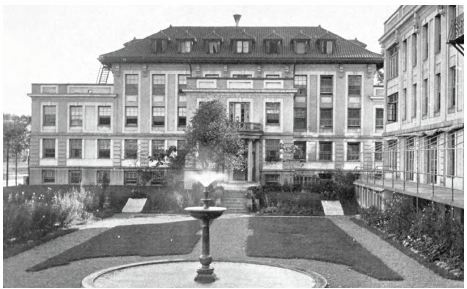 The century-old hospital complex first had to be largely demolished and the site cleaned up after a long history, first as residential use and then for tricycle manufacturing in the 19th century before it became a hospital by 1916. Montante hired Ontario Specialty Contracting to take down two buildings manually before imploding the main hospital tower in a dramatic cloud of dust in early October. Then debris had to be removed, and the soil cleared. Completion of the costly cleanup clears the way for construction. “This is a very unique site, but at the same time, it’s a very, very expensive site to build on,” Wallace said. However, the project still awaits site plan approval from the Buffalo Planning Board. That’s expected next month, but an initial review on Nov. 17 was met with criticism and opposition from neighbors, who objected to the colors and materials that were proposed for the facade, even after more than eight public meetings. Wallace noted after that meeting that 80 percent of the 142 people on the waiting list for the new apartments are from the two zip codes in that area, 14209 and 14222, demonstrating local support for the project. Still, he said he wasn’t surprised by the objections and concerns cited by area residents. 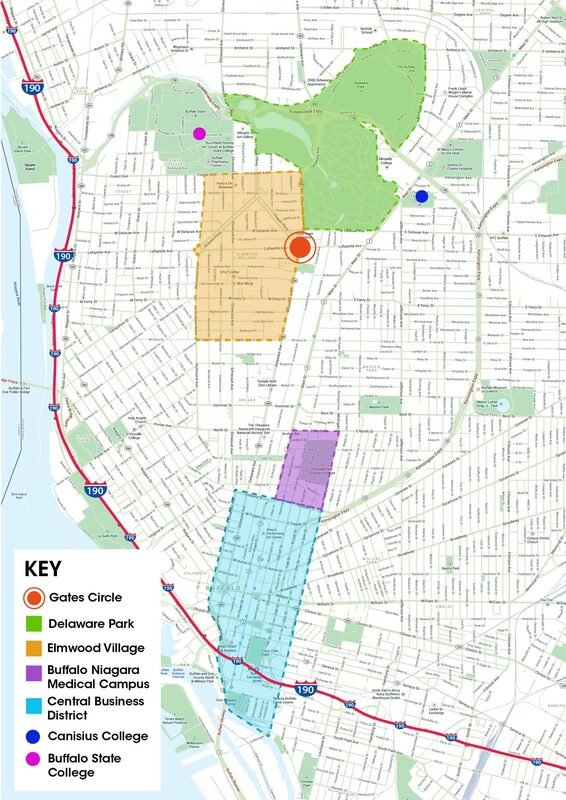 On October 19, 2015, the City of Buffalo Planning Board approved the final generic environmental impact statement (FGEIS) for the Gates Circle Redevelopment Project. The FGEIS includes a summary of the DGEIS, including necessary revisions and supplements; copies or a summary of the substantive comments received during two public comment periods as well as two public hearings; and the Buffalo Planning Board’s responses to each of these comments. TM Montante Development has made an electronic version of the FGEIS available here. Please click on the following links to access each portion of the document. This past Saturday was a truly exciting day for the City of Buffalo as the Montante Group successfully imploded the 11-story hospital tower overlooking Gates Circle. Despite the early hour and cold weather, thousands of people gathered to witness the implosion and bid goodbye to the Millard Fillmore Gates Hospital. As dawn approached, the cold was tempered as the sun broke through the clouds and the winds calmed, giving us an ideal window to execute this fantastic event. A little after 7am, we pressed the “button” that sent the building tumbling to the ground in dramatic fashion and perfectly on target – not a single tree along Gates Circle fell with the building. 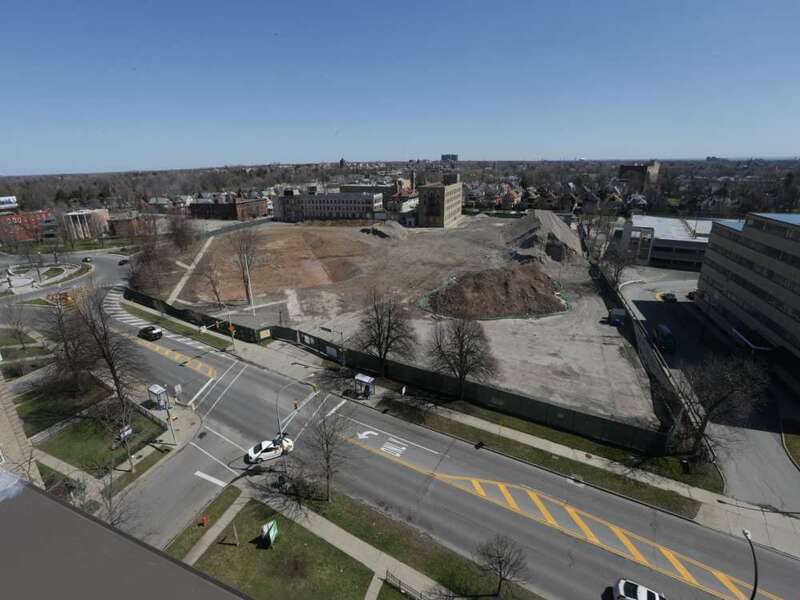 After the dust cleared, we were all greeted with a remarkable vista – a visible sign of the renaissance of the great City of Buffalo, as well as a major step forward for the Gates Circle Redevelopment project. The Montante Group would like to thank everyone who joined us on Saturday. We also thank the Buffalo Police and Fire Departments for working so diligently to pull off such an amazing event. For those who could not attend and for those wanting to reminisce, we are producing a video of the event that we hope will be completed in the next couple of weeks. Until then, click on either link below to view a 15-second “teaser video”. And please feel free to share the video with any friends, family, or colleagues you think might be interested. Why would thousands arrive in the pre-dawn hours, brave stiff winds and less-than-inviting temperatures? To take part in a milestone event that alternately bade farewell to local history and welcomed a new chapter in the region’s economic development. Or just to take part in a very large and very public communal moment. 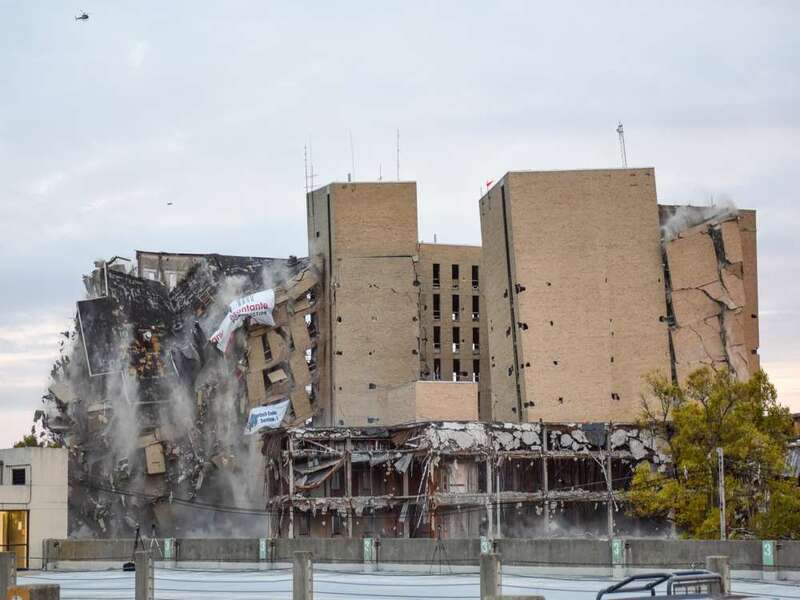 Regardless of the motivation, Saturday’s implosion of the former Millard Fillmore Gates Circle Hospital was an event that lived up to its hype and expectations. The main portion of the hospital came down in a matter of 10 seconds, thanks to strategically placed 500-plus pounds of dynamite and charges. Other parts of the hospital will be demolished during the next few months. The 6.7-acre site is being cleared for TM Montante Group’s $150 million mixed-use development plan that includes a senior housing component being built by Canterbury Woods. The property’s future begins on Tuesday when the Buffalo Planning Board is expected to approve Canterbury Woods’ site plan for a senior independent apartment building. Construction could start next spring once the Millard site is cleared. Meanwhile, the urban landscape along Delaware Avenue and Gates Circle is forever changed. The main tower of Millard Fillmore Gates Circle Hospital was reduced to a pile of rubble in a matter of seconds Saturday morning. Hundreds of spectators braved the unseasonable autumn cold, packing into a public viewing pen just north of Gates Circle near Delaware and West Delavan avenues. 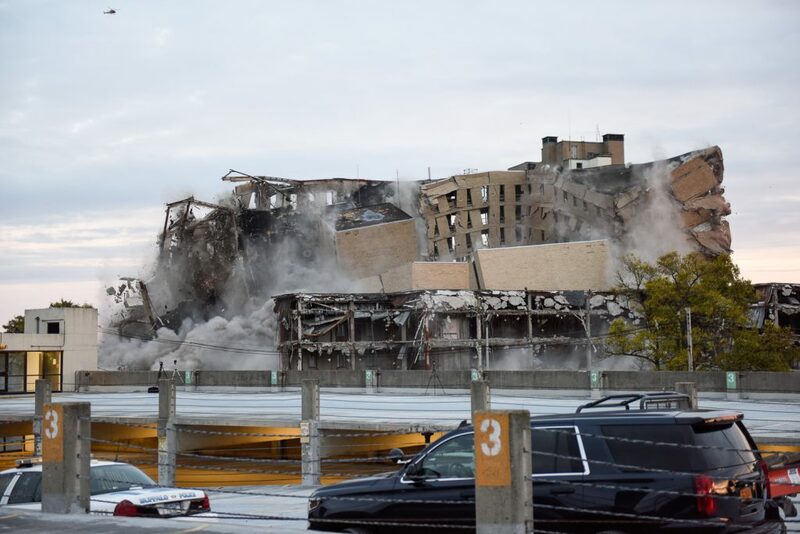 Then, the first indication the implosion of the 11-story former hospital building was a go was heard at 6:45 a.m.
That’s when the first loud siren from a Buffalo Fire Department truck cut through the air like a work day alarm clock. A loud electronic tone followed. The crescendo of excitement and anticipation grew among the spectators before the fourth and final alarm blast, signaling the final minute that the building would stand. A 10-second countdown from a nearby loudspeaker followed and the building was imploded. A plunger on the top of the nearby parking garage provided the catalyst for the blast that level the former hospital. A series of explosive charges caused the building to fall in upon itself. Roads were closed around a 500-foot safety perimeter around the site starting at about 3 a.m. The implosion was at least the fifth in Buffalo over the last two decades but the first since a 14-story former medical building at 50 High St. was felled by explosive charges on May 26, 2007. The demolition work was completed by Ontario Specialty Contracting of Ganson Street. John Yensan, the company’s president, said Friday the pile of rubble that remains will take an estimated three months to sort through and remove. Concrete will be recycled on site and used as a construction base in the redevelopment of the site by TM Montante. Yensan said steel from the former hospital building will be hauled away and recycled into new products. 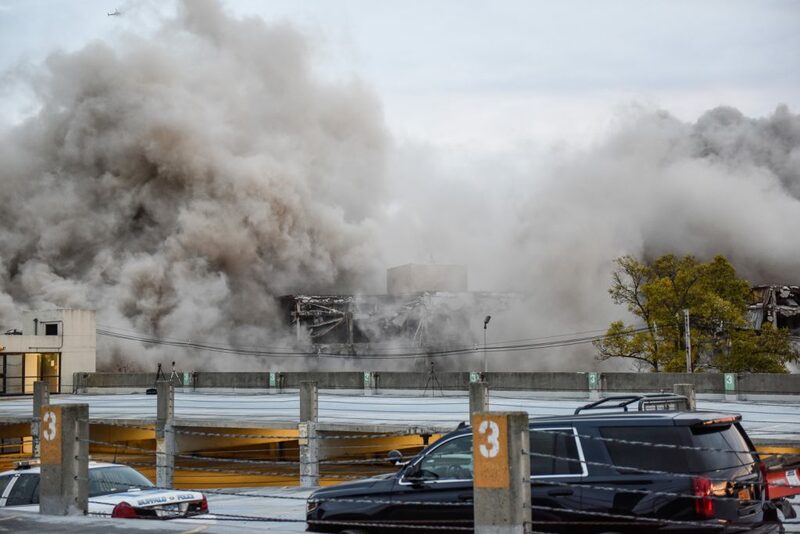 Air and seismic monitors were in place during the implosion, and a post-demolition survey – mirroring one taken before the demolition – was to be done in order to photograph and “document conditions of structures in the surrounding area” to assess any damage, Yensan said Friday. TM Montante Development’s vision for the Gates Circle site is a vibrant, diverse and high-quality urban place where people will love to be. 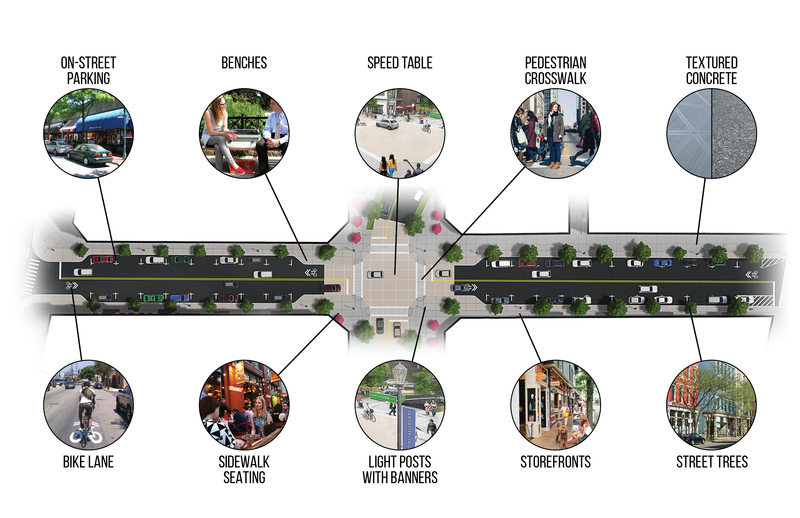 It will have a range of residential choices, a measure of class A office space, a health and wellness center, a neighborhood grocery store and local-serving retail and restaurants, all organized around a safe, walkable city street. A recent Another Voice column noted that a “thoughtful” project is needed at the historic Gates Circle site. We could not agree more, and that is exactly what TM Montante Development has been diligently working toward. This includes significant outreach with neighborhood residents in and around Gates Circle. We also proactively created a committee made up of leaders of neighborhood block clubs and other stakeholder organizations that meets on a monthly basis to gather community input on the direction of the project. We have heard the argument that retail doesn’t belong in this project. All we can say is that we don’t agree. People who are moving to urban centers to enjoy city living also want the convenience of being able to walk somewhere close to grab a cup of coffee or a gallon of milk. Our project’s proposed retail component features a neighborhood grocery store and a health and wellness center as well as multiple small retail shops to serve the people who will live, work and visit there. We also understand that many neighbors fear the possibility that “big box” retail will be developed on-site. This is not what we have planned, proposed or even considered. We agree that this would be an undesirable outcome for the community. A shopping center has no place on Gates Circle. Based on the feedback we have received, we feel that most people in the neighborhood and the broader community have embraced our vision and support this project – especially when just a few years ago the likely prospect was to have a vacant hospital looming over the neighborhood for unknown years to come. In the coming week, the Gates Circle redevelopment project will take a meaningful step forward with the implosion of the main hospital tower. By the end of 2015, the majority of the site will be cleared and ready for new development. We have spent a lot of time listening to the community during the past two years, which has led to several adjustments to our development plan. And we look forward to working with the community in the years ahead as we develop individual projects on-site that collectively transform the former Millard Fillmore Gates Circle Hospital into a vibrant, mixed-use urban district. The 11-story main tower of the former Millard Fillmore Hospital at Gates Circle will come down in a planned implosion in the early morning on Oct. 3, TM Montante Development announced late Thursday. Ontario Specialty Contracting will carry out the 7 a.m. implosion, which should level the structure in a controlled collapse in a matter of seconds. That will pave the way for construction crews to finish clearing the entire 10-acre former hospital site in preparation for a planned $150 million redevelopment project. Workers have already been taking down two other major buildings piece-by-piece. TM Montante, which acquired the site from Kaleida Health in late 2013 after the hospital closed in 2012, plans a mixed-use community with more than 500 residential apartments, condominiums and townhouses, in addition to a grocery store, fitness center believed to be the YMCA, office space and ground-floor retail shops. Additionally, Canterbury Woods plans to construct a separate 53-unit independent-living facility to anchor the project on Gates Circle. Canterbury Woods also operates a continuing-care community in Amherst. 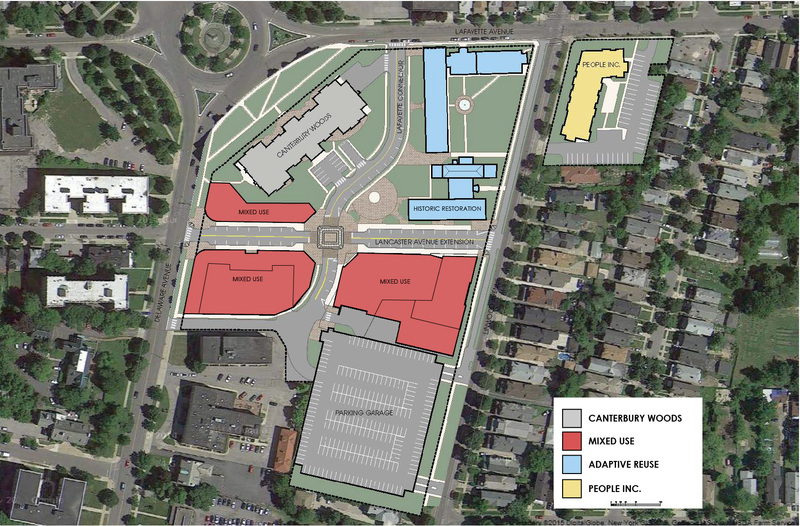 Specific plans have yet to be submitted to the City of Buffalo for any of the buildings, but the Canterbury project is expected to come up for review this fall. 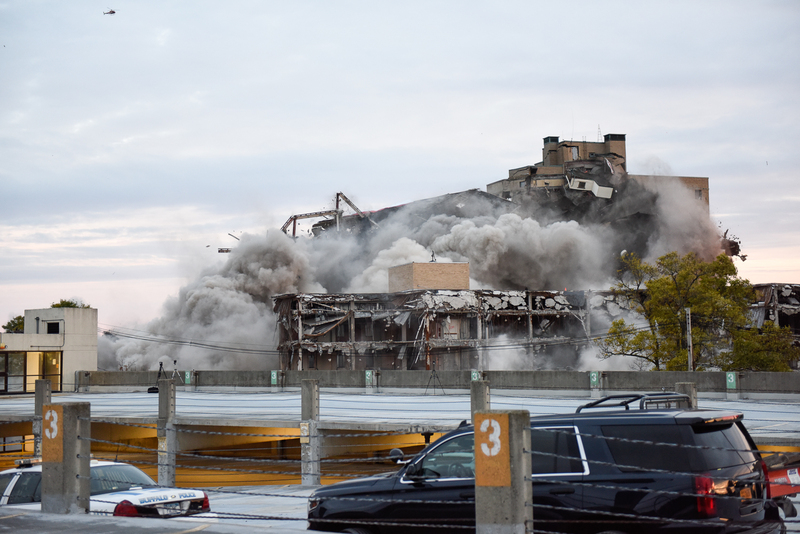 Ontario Specialty, the Buffalo-based demolition company, does building implosions and demolitions throughout Western New York. The company’s last building implosion was in 2007, the 100,000-square-foot medical office building at 50 High St., which cleared the way for the recent construction of Conventus – a $110 million project by Ciminelli Real Estate Corp.
Montante representatives are currently going door-to-door in the neighborhood, notifying residents about the implosion and answering questions. An informational session is planned next week for neighborhood residents, as well as a news conference. The much anticipated event is set for 7 a.m., Saturday, Oct. 3, officials from TM Montante Development confirmed late Thursday afternoon. And, with that, the Buffalo landmark will be reduced to a pile of rubble in a matter of seconds. Closed since the opening of the Gates Vascular Institute on the Buffalo Niagara Medical Campus three years ago, the hospital is being imploded to make way for a $150 million multi-phased development on the 6.7-acre site where Delaware Avenue intersects with historic Gates Circle. “This is a critical and exciting milestone in the site’s physical transformation into a vibrant mixed-use urban district,” said Christian Campos, TM Montante Development president. Among the projects planned for the property include a 53-unit senior independent apartment complex that is being developed by Canterbury Woods. Also planned is a 20,000-square-foot urban grocery store, a 65,000-square-foot YMCA branch, residential units and some office space. Canterbury Woods is slated for where the main hospital building currently stands. It is scheduled to open in 2017. Other portions will be developed during the next five to seven years. 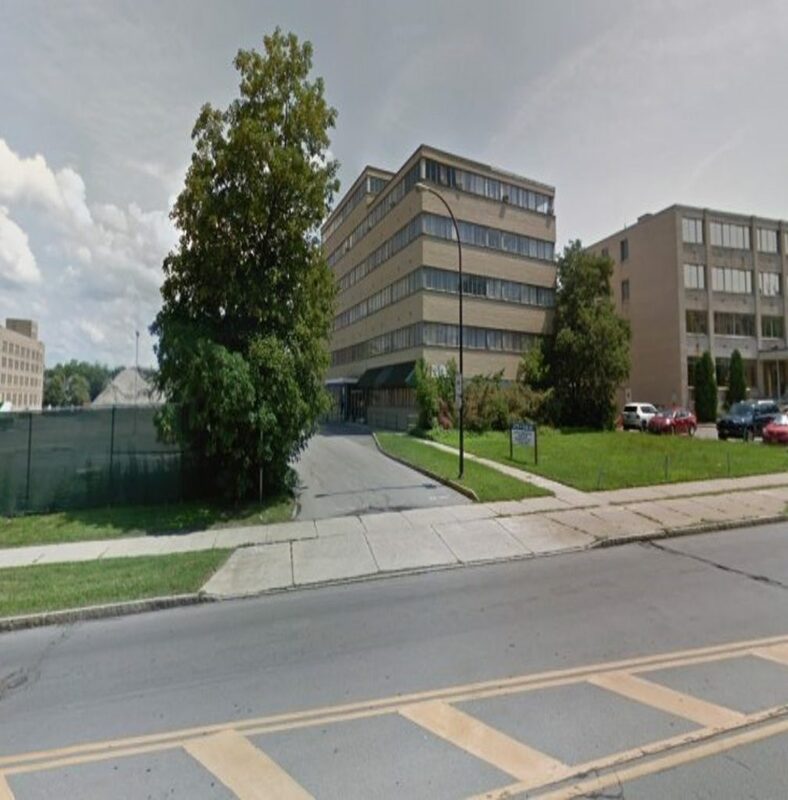 To prepare for the implosion – the first to take place in Buffalo since Ciminelli Real Estate Corp. imploded the former 50 High Street medical office building in 2007 – TM Montante will be meeting with residents near the hospital site in the coming weeks. Some of the meetings will include going door-to-door. Ontario Specialty Contracting will be overseeing the actual implosion. Pursuant to the New York State Environmental Quality Review Act (“SEQRA”), the Draft Generic Environmental Impact Statement (“DGEIS”) for the Gates Circle Redevelopment Project is published. The City of Buffalo Planning Board has made hard copies of the DGEIS available for review at the following locations: City of Buffalo Office of Strategic Planning located in Room 901, City Hall, Buffalo, NY 14202; and the Crane Branch of the Buffalo & Erie County Public Library located at 633 Elmwood Ave, Buffalo, NY 14222. Ontario Specialty Contracting is going to town on the former Gates Circle Hospital campus. Remediation and demolition at the 6.7-acre site is making room for a mixed-use complex by TM Montante Development. Demolition of the former power plant facility, located on the southeast portion of the former hospital campus, is underway. Crews have also begun interior abatement work in the former hospital tower building. Demolition of the former hospital tower is being targeted for this summer. Canterbury Woods is planning a a six-story, $30 million building, featuring approximately 53 independent living apartments, on the area where the former hospital tower currently sits. The goal is to have that parcel construction-ready by October. TM Montante Development will invest $35 million to develop a series of mixed-use facilities and common areas on the balance of the site. Market-rate and for-sale residential options including apartments and townhouses, a small grocery store and other retail retail space, medical offices, and a community health and wellness center are planned. Having secured approval from the Buffalo Preservation Board to raze portions of the now-closed Millard Fillmore Gates Circle Hospital, Montante Construction will begin its first outward sign of the $64 million Delaware District project. The Tonawanda-based Montante hired Ontario Specialty Contracting to oversee the remediation and demolition work on the 6.7-acre site, located where Gates Circle and Delaware Avenue intersect. First up, demolition of the campus’ former power plant building. That work should start be early March. The demolition work is one of the earliest phases of the project that will see the former hospital property transformed into a city campus for Canterbury Woods life care community. Canterbury Woods will be constructing a six-story, 53-unit independent living apartment complex where the bulk of the now-closed hospital sits. Other phases include the development of an urban grocery market, offices, a series of market rate residential units. The YMCA of Buffalo Niagara has signed a letter of intent to move its Delaware Avenue branch to the site. Demolishing the power plant needs to be completed thus summer to meeting requirements mandated by the current brownfield program. The actual razing of the main hospital building is scheduled to start this summer. “This will be a systematic, but dramatic, transformation,” said Doug Elia, Montante Construction president. Redeveloping the former Millard Fillmore Hospital site at Gates Circle in Buffalo is a mammoth job, but the project will take an important small step soon. The Erie County Industrial Development Agency’s lending arm Wednesday approved a $2 million loan to Gates Circle Holdings LLC. TM Montante, the lead developer, formed Gates Circle Holdings to oversee $13 million in demolition, abatement and remediation at the site. The $2 million loan from the Regional Development Corp. will go toward removing ruptured underground storage tanks and contaminated soil on the property, said J. Timothy Vaeth, president of TM Montante Development. It’s the sort of unglamorous but necessary work that the developer must complete before the project’s big-picture vision can unfold. Plans call for the site to include a Canterbury Woods retirement community, a YMCA community center, 500 residential apartments and a grocery store. 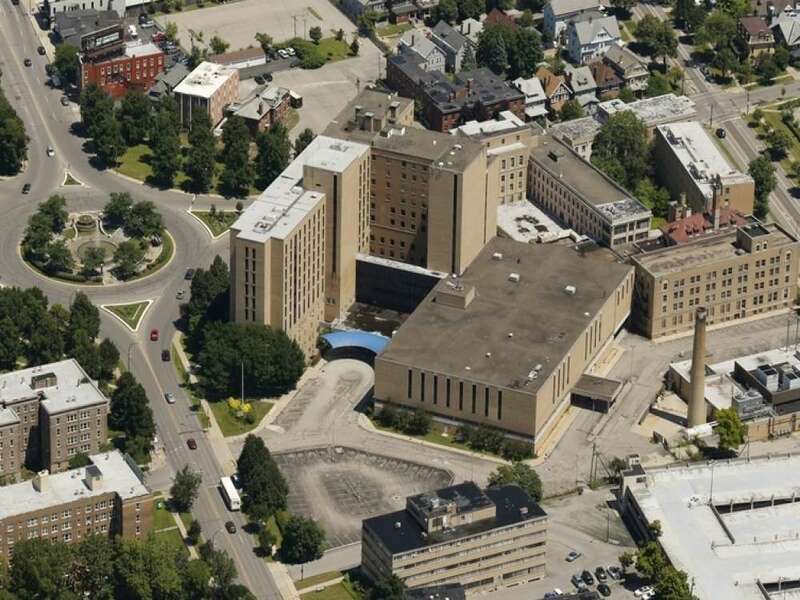 The entire project could exceed $100 million and revitalize a site whose future was unclear when Kaleida Health moved the hospital’s operations to the Buffalo Niagara Medical Campus. Vaeth said that it was important to complete the remediation work this year, since TM Montante is counting on receiving state brownfield tax credits to cover the costs. The tax credit program is set to expire at the end of the year, and while there are proposals to extend it, that is not yet ensured. TM Montante next week will discuss demolition of the complex’s power plant with the city’s Preservation Board. And plans call for demolishing the hospital tower this summer to make way for Canterbury’s six-story building. The developer’s goal is to have the site ready for Canterbury’s part of the project to start construction by September. Local leaders who serve on the ECIDA board said they were pleased to see the project move forward, given fears that the vast property might sit vacant after the hospital left. Erie County Executive Mark C. Poloncarz said the property is in a highly visible spot, so its redevelopment resonates. “That is a key sort of meeting point between a number of neighborhoods,” he said. The $2 million loan was the largest ever granted by the ECIDA’s RDC loan division. Officials from TM Montante Development and YMCA Buffalo Niagara have announced that they have signed a letter of intent (LOI) to explore the possibility of developing a new city-based YMCA family branch at the site of the former Millard Fillmore Gates Circle hospital. The LOI sets the stage for the two organizations to move forward in assessing the viability of relocating the current Delaware Avenue YMCA into new, state-of-the-art space as part of the $40 million redevelopment effort being led by TM Montante development at Gates Circle. A market study is already underway exploring the potential of locating a YMCA in the development. A community health/wellness center has been a key component of TM Montante Development’s vision for the site from the time the company was selected as the designated developer for the ten-acre parcel, according to TM Montante Development president Timothy Vaeth. YMCA Buffalo Niagara opened its current Delaware Avenue facility in 1927. Part of the attraction to explore a new location is the expanded programming and service opportunities the new space would provide, for which the current building does not have capacity. The organization has successfully opened new branches in Amherst and Orchard Park in recent years. The study will look at the viability of developing an approximately 70,000 sq.ft. facility that could serve the community-at-large, as well as the residents of the $28 million campus of Canterbury Woods, the region’s premier retirement living community, which is being developed on the north end of the site. Current plans have the YMCA facility co-located in a larger, multi-tenant structure fronting on Delaware Ave.
No timetable has been set for completion of the market study, and a final decision will need to be approved by both the YMCA Buffalo Niagara board of directors and trustees. In addition to Canterbury Woods and a potential YMCA facility, plans for the multi-million dollar mixed-use redevelopment of the Gates Circle site include approximately 500 market-rate and for-sale residential units, small retail shops, office space, and possibly a grocery store. BUFFALO, N.Y. (WIVB) – Monday night, residents got a first-hand look at plans to revamp an historic hospital in Buffalo. Canterbury Woods Senior Assisted Living Complex will be one of the first buildings to go up at the former Millard Fillmore Gates Circle Hospital, taking the spot where the tower currently stands. “Canterbury Woods is a big component of the project, but at the same time they’re only going to take about 15 percent of the land. We’re talking about 10 acres of land,” said Tim Vaeth, president of TM Montante Development. Lancaster Avenue will be extended, bridging Delaware and Linwood Avenues. Vaeth says during this first phase another building will go up where there’s now a parking lot. Above the grocery store and wellness center there will be offices and condos or apartments. But first the old buildings have to come down, mainly the huge Millard Fillmore Gates Circle Tower. “You’re talking about a facility that is almost 900,000=square feet, and you think about that, that’s the HSBC Tower, that’s the Walden Galleria. It’s a huge structure that’s left behind so we’re going to have a lot of demolition and a lot of debris that’s going to come off the site,” said Vaeth. He doesn’t expect it to cause much of a disturbance to the neighborhood, because they have 10 acres of land to stage the demolition. He’d like to tear down the tower this year, with construction beginning at the start of next year for the first two buildings. There will be another phase with more residential and office space. Neighbors are excited about the new plans. “I’m ready for it to get going; it’s been a long wait,” said Cynthia Schwartz, who lives on Auburn Avenue and is part of the Community Advisory Committee. “They’re actually improving the neighborhood and increasing its value,” said James Derby, who lives on West Ferry. “We’re an aging community so it really meets our needs. There are a lot of wonderful things going on,” said Gretchen Gross, a concerned resident. Developers stressed at the meeting plans could change based on community input. The first two buildings are expected to be complete by January 2017. The hospital has been closed for a little over two years. TM Montante Development Co. is getting closer to nailing down two crucial tenants for its $63 million project on the site of the former Millard Fillmore Hospital campus at Gates Circle. The YMCA confirmed that it is considering 55,000 square feet of space on the site for a new Buffalo location that would replace its current one on Delaware Avenue just north of Hertel Avenue. Montante also confirmed that it has spoken with Tops Friendly Markets, Lexington Cooperative Market, Dash’s Markets, Wegmans and Whole Foods as it looks to fill 25,000 square feet of grocery retail space that it plans to build new on the site. At least two of those stores are out of the running, and Montante is having serious talks with two more. Buddy Campbell, CEO of YMCA Buffalo Niagara, said his organization is in “very preliminary discussions” with Montante and is waiting for results from a market study to be returned over the next few weeks before deciding whether the site would suit its membership. The wellness center would adjoin the existing 800-space parking ramp that TM Montante is hoping to buy from the City of Buffalo. The grocery store would be situated along Delaware Avenue and Lancaster Avenue, which TM Montante plans to extend to connect with Linwood Avenue. Tops and Lexington Co-op are possibilities for the space, though neither grocery store nor the developer would confirm they are considering the location. “Tops is still exploring all possible options, and because there are no preliminary agreements in place, it is too soon to be able to comment about any potential, specific location,” said Katie McKenna, a spokeswoman for Tops. Lexington Co-op has confirmed that it is looking to expand to another location but declined to comment on any possibilities. Still, the process of elimination seems to hint that they are strong candidates. Dash’s Markets, busy with its renovation of the former Budwey’s location on Kenmore Avenue, has confirmed that it has no plans to locate on the Montante site. Whole Foods, said to be looking for space in the Northtowns, also appears to be out of the running. J. Timothy Vaeth, president of TM Montante, said the company researched the demographics and economics of the surrounding area, compared them with data on the two stores’ other branches, and concluded that the nearby community is capable of supporting a store in that location. Vaeth said he hopes to have letters of intent signed with a grocery store within the next couple of weeks and with the wellness center by June 13. TM Montante Development, the company leading the transformation of the former Millard Fillmore Gates Circle hospital site, is planning a forum to help foster conversation about the project with neighborhood residents. The event, “A Conversation on the Future of Gates Circle”, will be held on Monday, June 9 from 6-8 p.m. inside the Burchfield Penney Art Center, 1300 Elmwood Avenue on the Buffalo State College campus. The event is open to the public. Attendees at the forum will hear from the development team and have a chance to view and comment on the proposed site plan and project renderings. The program will be led by representatives from TM Montante Development and by Robert Shibley and Bradshaw Hovey of the UB Regional Institute, which was recently hired by TM Montante Development to assist in shaping the development vision and in engaging the community in important discussions regarding the project. TM Montante Development was selected as the designated developer for the 10-acre site late last year. Initial plans call for a $63 million mixed-use development, including a $28 million campus for Canterbury Woods, the region’s premier retirement living community, and a series of mixed-use facilities, including market-rate and for-sale residential options, retail and a community health and wellness center. The project will also feature a number of green and sustainable design elements, including a meaningful solar component as a source of alternative energy, as well as significant green space. The company plans to start construction next year. As part of the project, TM Montante will be opening a construction office near Gates Circle in the coming weeks, and will eventually move the company’s headquarters to the Gates Circle site. Developers for the closed Millard Fillmore Gates Circle Hospital site have taken another step forward, unveiling a website with information on the apartments that will be part of the new $28 million Canterbury Woods retirement living community. The site (cwgatescircle.org) includes information on the community as well as information on a charter resident program for individuals to gain priority placement for apartments ahead of its 2016 projected opening. A sales and marketing office is expected to open near the site in the coming weeks, with construction slated to begin on the city campus in early 2015. “We believe that Canterbury Woods Gates Circle will be one of the most important developments in senior living that Western New York has seen in a generation,” said Robert Wallace, president and CEO. According to the website, charter residents will receive the lowest entrance fees ever offered, with 2014 rates locked in by a $2,000 refundable deposit. Charter members will receive credit toward upgraded finishes, flooring and cabinetry; the widest choices and highest priority for parking, views, sizes and styles; as well as exclusive invitations to events, speakers, receptions and parties. The downtown Buffalo campus will be the second for Canterbury Woods, which operates a 300-unit continuing-care retirement community in Williamsville. Founded in 1999 by nonprofit parent Episcopal Church Home & Affiliates of Western New York, the Amherst site houses a mix of independent apartments, assisted living and skilled nursing units. It is among just 13 organizations designated by the state to operate a CCRC, which provide a continuum of care for individuals 62 and older. Residents enter the campus at the residence level that meets their current needs, then have the ability to shift to the appropriate level of care at no additional cost as their needs change. The retirement community is one component of a $63 million development plan at Millard Gates nonprofit by TM Montante Development, which was selected by Kaleida Health last fall to redevelop the site. In addition to the retirement community, other plans for the 10-acre site include mixed-use development including residential options, retail components and a community health and wellness center. In March, TM Montante hired the UB Regional Institute to bring the immediate neighborhood and stakeholders into the planning process. Kaleida shut down the Millard Gates property in March of 2012 when hospital operations were shifted to the Buffalo Niagara Medical Campus. Kaleida Health has selected TM Montante Development and the Episcopal Church Home & Affiliates to redevelop Millard Fillmore Gates Circle Hospital. Reuse of the property had been the subject of an international design/development competition with a $1 million prize for the winning proposal. A previous plan for a veterinary school for the site fell through. The nearly 900,000 square foot hospital complex sits on 10 acres. Canterbury Woods will feature independent living and assisted living apartments prominently situated on Gates Circle facing Chapin Parkway (below). The main hospital building would be demolished. TM Montante Development will invest $35 million to develop a series of mixed-use facilities, including market-rate and for-sale residential options including apartments and townhouses, a small grocery store and other retail retail space, medical offices, and a community health and wellness center. The project will feature a number of green and sustainable design elements, including a meaningful solar component as a source of alternative energy, as well as significant green space. The plan seeks to extend Lancaster Avenue through the site to connect with Linwood Avenue. TM Montante is working with Wendel and Architectural Resources on the reuse plan. Environmental remediation and site preparation is expected to start in the spring of 2014, with construction activity targeted for late 2014. The majority of development is expected to be complete by the end of 2016. “Having the chance to develop an important site such as Gates Circle, with like-minded, committed partners and tenants, is truly an unique opportunity that we are privileged to be part of,” said Timothy Vaeth, president, TM Montante Development. In 2012, two development teams submitted proposals for the site. Uniland Development and Chason Affinity had vastly different ideas for the property. Uniland’s proposal called for clearing much of the site and constructing “Chapin Place,” 276 residential units and a boutique hotel, restaurant and retail and professional offices. Chason Affinity proposed a veterinary school. Chason Affinity was selected by Kaleida to develop the site but that deal collapsed earlier this year when Ross University School of Veterinary Medicine backed out of the project. Kaleida Health reissued a Request for Proposals and received responses from TM Montante, Uniland Development and Benderson Development. Episcopal Church Home operates the Canterbury Woods senior community at Klein and Youngs roads in Amherst. It features a variety of living options with varying levels of care to allow seniors to “age in place.” Episcopal also operated a nursing home near the Peace Bridge that was left vacant and unkept for many years until the State agreed to buy it to expand the Peace Bridge’s plaza. TM Montante is currently developing a business park off of River Road in Tonawanda and is redeveloping the Hager Planing Mill on Elm Street into upscale lofts and commercial space. Kaleida Health has already begun the reuse process for the Women & Children’s Hospital of Buffalo, which is scheduled to move to its new home at the end of 2016. A similar development rights RFP for the Bryant Street campus is expected to be released in 2014. Please contact Donna Kostrzewski at TM Montante Development for more information regarding leasing inquiries. Please fill out the contact form on this website to send us an inquiry. One of our representatives will get back to you within 48 hours.